The countdown continues until I head out West for the Tahoe Rim Trail Endurance Run on July 16th. Right now I am tapering and doing some planning. I'll have some more updates and info on the race in the coming weeks but in the meantime let's talk about Bonanza. Being a baby boomer and a child of the 50's and 60's I grew up watching the show every week. I was 4 years old when the series began it's 14 year run on TV and like most boys I was a huge fan of Westerns. I almost felt like the Cartwrights were friends of the family. 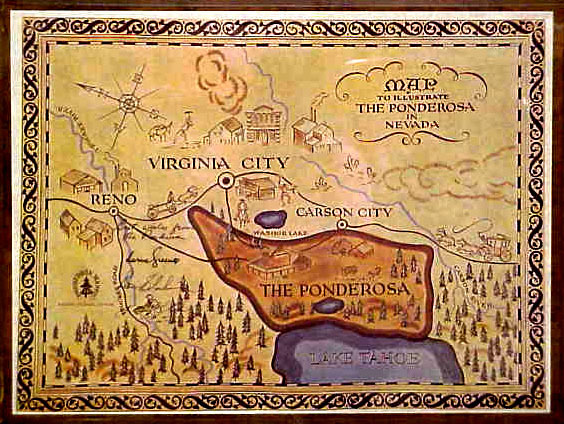 As I prepare to head out to Nevada I was remembering the map of the Ponderosa from the opening credits and from frequent references to Virginia City I knew it was close to Lake Tahoe. That made me wonder just how close I would be to the fictional ranch while running in the race. 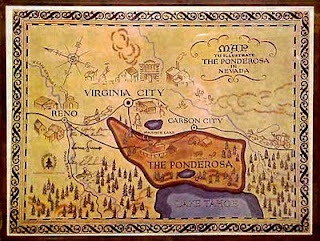 Upon examining the map, it looks like the entire race is held within the boundaries of the Ponderosa ! How cool is that ! You have to note that the map is turned wrong but if you notice the compass is turned with North off to the left then you can get the proper bearings. The little blue lake near Lake Tahoe is Marlette Lake which we run by several times. The 30/80 mile mark in the race is just above Incline Village which is where the opening credits of the family riding up on their horses was filmed. A replica of the Ranch was built there and still stands today but is no longer open to the public. So as I run around the course I will imagine Ben, Adam, Hoss and Little Joe riding along on the trails welcoming us to their Ranch. And maybe Hop Sing will be cooking something for the aid stations. Ahhhh . . . the very first color TV show I ever saw! Who didn't love Bonanza?? Sounds like a sweet race. Looking forward to hearing about it. The Ponderosa. Man, that brings back memories. Fun to run with Hoss.